I just bought this Trek 930-ebay Why was there so little interest in it. They Trek rigid MTBs(820,830,850, 930,950)-Cromo frames-in this case double butted-make great city/suburban/light trail bikes. I didn't notice anything particularly bad about this bike-cables a bit rusty, few rusty fasteners-no big deal. Rigid fork, steel mountain bikes just do not sell well. Add in that it needs new cables and brakes, $50 was a fair price. Cleaned up with all the service the most I could sell it for would be $125. But you still got a pretty good deal on an under appreciated bike. I am sure it will give you more than your $50 worth of fun. I have a Trek 950 that is my regular ride-great urban trail bike.Other regular ride is Trek 730- 700c version of the 830 more or less-straight gauge Cromo. This one I will sell for $170-$180 after replacing one or two cables and generally cleaning adjusting it-less than $5 parts maybe 1 hr labor. Of course New Orleans has become a big time bike town-we have 5 universities-and the area behind the French Quarter(Marigny) is a magnet for younger folks who like bikes. A decent Cromo steal frame bike will sell OK. They are generally fans of steel frames and aware that Cromo means Better/lighter. The universities and the Marigny folks keep prices up a bit.We have a HUGE bike theft problem-probably doesn't help sales of nicer bikes. Interesting that Pa and NC seem to have lower prices than NOLA. We are usually a low ball city. IMHO, vintage, rigid frame MTBs, are the best deal in bicycling right now, particularly for the recreational rider. Why buy some crappastic Walmart bike, when you can buy a vintage, name brand MTB, with top end components, for about the same money? MTB's are certainly good bargains around here: I occasionally see the best Treks going for $50 or less, and I've seen a few absolutely ridiculous deals on Konas and high-end Marins as well. (One of them is my winter ride). Also - For anyone looking for a really robust tourer, I think an older large-framed MTB conversion is a really clever, economical way to go. Off-topic, I know, but Auchen, my 22-year-old son is interested in a mountain bike for urban trails, too, but was turned off by LBS prices, and also turned off by the x-mart offerings. I tried to convince him to try CL for name-brand mountain bikes, but neither of us know anything about them, so he's uninterested. Can you offer any more suggestions to what you've stated above? Although I think he's set on front and rear shocks, which are not vintage and not cheap, either, correct? MTBs are kinda driven by a younger crowd who are interested in the latest greatest components. This means that almost any 5 yo MTB- especially full suspension bikes- are going to depreciate-a lot. By a "lot" I mean a $1600(or so actual new selling price several years ago) Giant NRS from maybe 7-8 years ago will sell for maybe $400 or so. I know this because I have a NRS -bought used-and that is what it would sell for.It has a very modern-kinda complicated-rear suspension which takes away much of the "bob" that suspension bikes are known for. Like Auchencrow said- lots of lasts years news MTB- are available for very low prices-prices bordering on very low end bike store or high end Walmart bikes. The reason I can sell the 930 etc for $170 is because that is less than what a somewhat nice sports store bike sells for and roughly what the nicest Walmart bikes sell for. Urban young folks prefer a "not Walmart" bike. Frankly Walmart $100 bikes are pretty good bikes for $100, but I have to pay $20 to make any $$ selling them-usually sell for $40 or so. On another note the Trek 930,950,970 are really great deals.They were originally sold as MTBs-early 90's-when rigid MTBs were still considered MTBs.In truth they are actually the worlds greatest urban do anything bikes.The rims allow skinny slicks or wider lower pressure tires for whatever your particular city throws at you.They also have double butted cromo frames.Where else can you find an entire DB cromo steel frame bike for under $200-and occasionally for under $50. I've never actually found a 900 series Trek for less than the $120-delivered-that I paid for this, but in some areas-PA and NC- apparently they are really cheap. In NOLA- lots of young folks-they are aware of the desirability of cromo frames especially DB- so I usually sell a bike like this for >$175 or so. The 800,820,830, 850 are slightly downscale-components and frame material-so they sell for $100-$130(the 850 is DB but not the True Temper OX). Other manufacturers-made equivalent bikes-Diamondback, Gary Fisher, and they sell for roughly the same $$. I posted because I was surprised there was so little interest in a bike I knew was worth $170+ here-NOLA. Now NOLA in general doesn't have the high prices the west coast and some other big cities have.The season-getting cold and wet many places- mkaes a difference.I might have to wait for "spring" late Feb Mar here- to get $175 or so.Might sell it for as little as $160 in the cold dark near winter. It's a MTB. The vintage market for them has yet to kick in; I'd guess it might be 4-5 more years before the value kicks up on them. You're seeing some glimmerings of this now; early Stumpies and the Bridgestone MBs now carry some value. You can still find pretty decent early MTBs for nothing. I have two I paid precisely that for; a Ross Mount Hood and a Shogun Prairie Breaker III, which I converted to a touring/city type beater. I'm pretty sure in a few years you will no longer to be able to find them cheap. And the components are seriously undervalued; MTB era mechs are pretty nice in general. The vintage, rigid fork MTB market is very soft. These are good quality, very rugged bikes that can take a lot of abuse. They're great campus beaters because you can climb a curb, roll down some steps and keep right on riding. They're not desirable to theives because the parts are not very valuable so theft is low as long as they're locked up. These are great bikes for riding on gravel MUPs too. That's where I use mine. Typical flipping potential is only $100 with a few exceptions that bring a little more. $150 is very difficullt to get. I paid $60 for a 1990 Trek 950 MTB locally from Goodwill which now wears a NuVunci hub. I agree that the older pre suspension MTBs are the biggest bargains around as far as used bikes are concerned. Most have vertical dropouts so they are not suited for FG conversions. In many markets this has decreased their value. Also they are the commonest decent quality bikes around from the mid 1980s to mid 90s period. This is exactly what I am doing with an 80's schwinn high sierra. Drop bars and 26" rims. I must be ahead of the curve or something... 2 of the best bicycle I have ever owned cost me $25.00 to acquire. 1988 Kuwahara Shasta, triple butted lugged frame, hand built. 1987 Kuwahara Cascade, quad butted Ishiwata tubes, lugged, and a hand built model. Will agree that these bikes are among the best values out there and there are some beautiful frames; the double butted lugged Treks are gorgeous, Specialized made some beautiful frames, as did many other companies. There is a lot of interest in old mountain bikes here as they make such excellent all around commuters, utility bikes, and expedition level tourers. Last edited by Sixty Fiver; 08-12-13 at 08:25 PM. Those Kurahawas are simply gorgeous. Yes the cromo rigid mtb are great do everything bikes. Those Kuwahawas are simply gorgeous. Kuwahara made a wide range of models and their upper end models were (hand) made in Japan while lower end bikes were outsourced to their other factories in Asia... they made bicycles for a lot of companies including Schwinn and believe the Schwinn Sierra is a Kuwahara made bicycle. Kuwahara made a Sierra Grande for many years and it vied for top spot with the Cascade which was always a top end model, even when they were branded as Apollo / Kuwahara bicycles. The coolest Kuwahara I have ever seen was another '87 Cascade that was also quad butted and lugged but has a sloping top tube...it's owner knows that if she ever decides to part with it she needs to call me. They seem to be rather uncommon in the US and wonder if Kuwahara had a regional agreement with Schwinn not to compete by selling nearly identical bikes. My Cascade was purchased in nearly new shape for $25.00 while the Shasta came to me as a free frame and fork and I built around that... I love the geometry and have run both bikes as SS and fixed gear versions as they have horizontal drops, and this made fitting a 3 speed to the Shasta a no brainer. The Cascade has seen tens of thousands of miles since I found it 4 years ago and this year converted it back to a geared bike after using it as a fixed gear bike for several years... 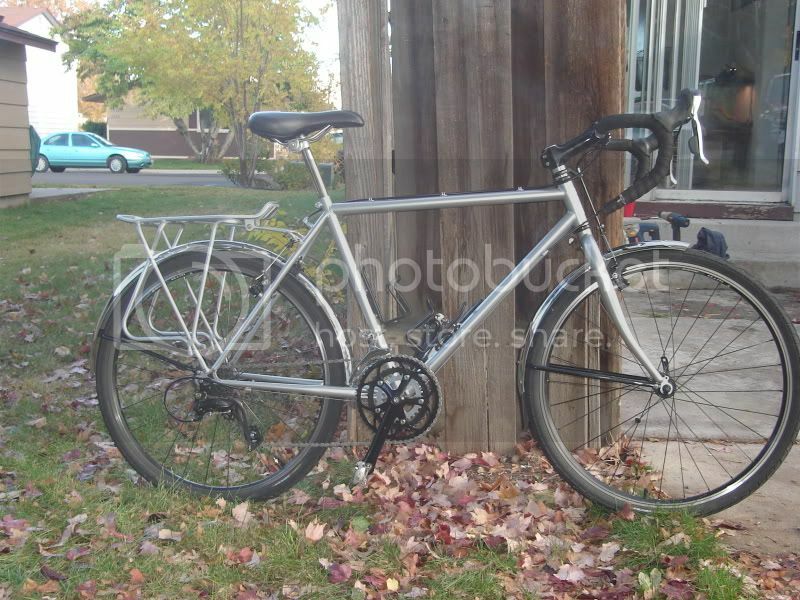 I could have bought a Miyata 1000 but found that my Kuwahara is all the touring bike I could ever want or need. I've never seem-in person or on CL- a Kuwahara here in south Louisiana. What tubing did they use? The cromo rigid mtb (especially name brands like Trek)and to some lesser extent the decent ones with suspension forks are steady sellers here in NOLA. Now that I think of it ,I probably mainly sell the Treks. It is much easier to sell a Trek than the equivalent Diamondback or even Specialized Hardrock. I don't sell many Schwinns, because I don't find many decent cromo Schwinns of any type(26 or 700c). Folks who want them for transportation-students and younger adults-aren't bike nuts, so they buy what they have head of- or have owned before. The 700, 800, and 900 series Treks sell well, but the 700 series(700c wheels, but otherwise much the same as the 800, 900) are too expensive to buy and sell for a profit now-they have been discovered. So where do you find these Kuwaharas and what tubes do they use? Kuwahara used Ishiwata tubes on their high end models... the '87 Cascade has quad butted tubes and the Shasta got EX tubes in '88. My friend has a bike shop and he picked it up from another shop that had taken it in trade and sold it me for what he had paid... $25.00 and the Shasta was a gift from a friend that had it and then decided they did not want to build up the frame. Te straight gauge frames from this era are also very nice and some of these were also very well equipped... I had a Siera Grande last year and it was a fabulous bike. Don't call them mountain bikes of course. I agree that MTB prices appear to have climbed, hybrids as well. There are occasional reasonable deals if you don't mind projects. But if you look long enough you can find them. They all are rigid cromoly frames, and only two require substantial paint touchups. This year my $50 and under include a Hardrock, a 1991 Trek 990 (no wheels), Diamondback Outlook. My $35 and under deals include a lugged Trek 930, Mongoose Rockadile, Univega Alpina. The big money bikes include a Trek 950 and a Miyata Terra Runner, both well under $100. Small framed women's step through MTB's are impossible to find at these prices. Go figure! Last edited by oddjob2; 08-10-13 at 09:27 AM. Right now my ride of choice is this tall TREK 830 - a true steel Cro-Mo Tange triple butted gem. Cost "as is" was $15 and I use it more than any other bike I own (and I own plenty). Not sure I agree. I s'pose for a very cherry sample, maybe, and depends on geographic location? Here in SoCal, it's all about the fixies and Dutch-copies (think: Linus). I just picked one up for way less than $100. It's a '95 in the color scheme I remember the most from my college years. Unfortunately, it's a bit banged up, and was a theft-recovery (rebuild w/ wrong wheels/seatpost/saddle) and it'll take about $60 to fix it up proper. Fortunately, with the cheap MTB parts flooding CL these days, I hope to build it into an street bike for the Mrs, or for a decent flip. Will remember to market it as "comfortable, vintage, Made in USA urban hybrid commuter" to attract the hipsters.